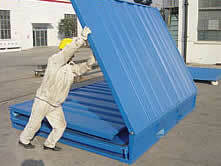 Folding Portable Steel Storage Shipping Containers from Global Portable Buildings, Inc. Floor capacity: approximately 6,800 lbs. Built with 1 mm thick painted galvanized steel, this model is a durable, cost-effective storage solution. 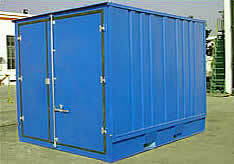 Easy to assemble and transport, these units may be all you need to fulfill your storage requirements. Each building is foldable, for quick and efficient transportation or storage; 16 storage units, folded, can fit on one 40’ flatbed truck for shipping. Standard features include foldable structure, double steel doors and moisture-resistant, durable composition floor. Great cost/benefit ratio. Delivery of this model is available to all destinations in the USA and worldwide.